Apios americana (ground nut) tubers. en.wikipedia.org (Accessed 8/2017). Apios americana is a perennial, herbaceous, twining vine 1-3 m long; colonial from rhizomes with fleshy, edible tubers 1-2 cm wide; Roots have nodules caused by nitrogen fixing rhizobial bacteria (Duke 1983); stipules linear, 0.5-0.6 cm long, deciduous (Radford et al. 1968). Leaves alternate, stalk 2-7 cm long, swollen at base; blade 10-20 cm long, pinnately compound, leaflets 5-7, stalks 0.4 cm, swollen, that of terminal leaflet to 1.5 cm; leaflet blades lance- to egg-shaped, 3-6 cm long, about 2.5 cm wide (Yatskievych 2006). Apios americana flowers. By Arthur Haines. Copyright © 2017. gobotany.newenglandwild.org (Accessed 8/2017). Flowers brownish-purple, bilaterally symmetrical, fragrant, pea-flower shaped, 1-1.3 cm long, upper petal (standard) 0.9-1.3 cm long, 1.1 cm wide, usually notched at tip, folded over curved base petal (keel), side petals (wings) pointing downward, keel curved sharply back into flower with tip against standard; stamens 10, 9 with filaments fused around style, the tenth solitary; calyx tubular, about 0.3 cm long with a single, elongate lower lobe; inflorescence 5-15 cm long, of spike-like clusters to about 8 cm long, inflorescence stalk about 5 cm long (Yatskievych 2006; Radford et al. 1968); blooms June-Aug.; pollinated mostly by bees (Duke 1983). Apios americana (ground nut) fruit. JK Marlow. Naturalized and native plants of the Carolinas and Georgia. 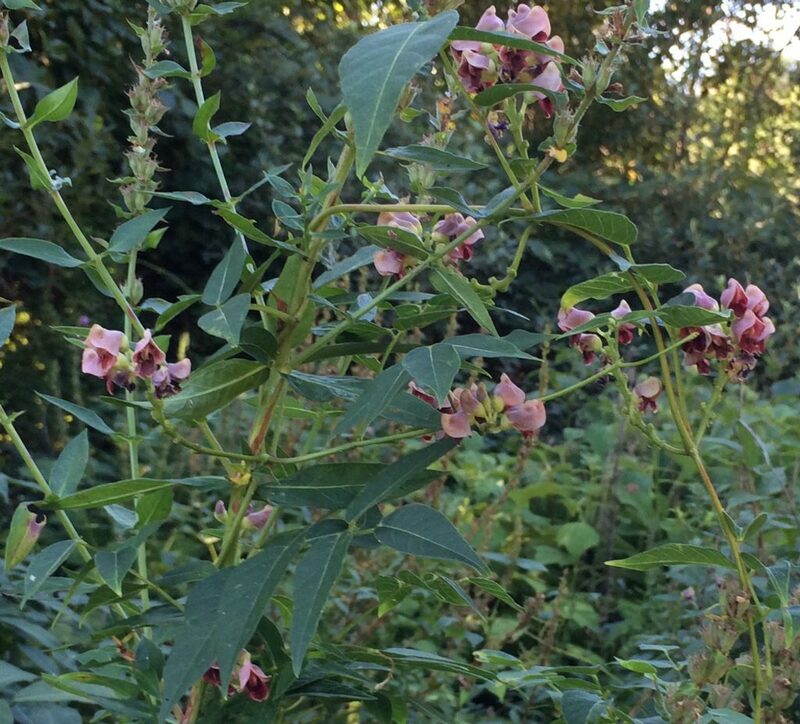 namethatplant.net (Accessed 8/2017). 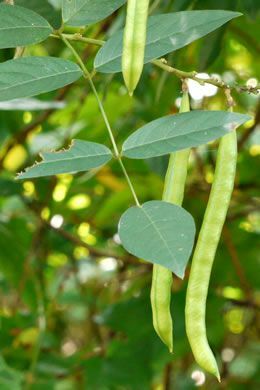 Fruit becoming dry, pod (legume) 5-10 cm long 0.4-0.7 cm wide, with several seeds, twisting spirally at maturity and splitting open along upper and lower ribs, leaving coiled legume walls on plant after seeds fall; fruit mature July-Sept. (Radford et al. 1968). Habitat: Moist or wet woods, marshes and edges, in sun or part shade. Soil pH 4.5-7.5. 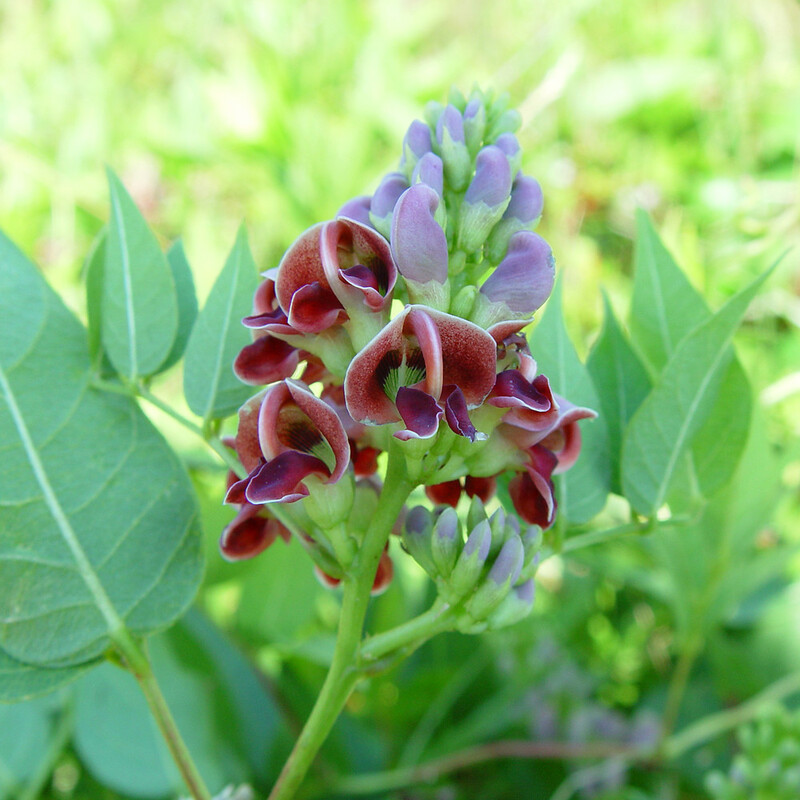 Tolerant of anaerobic soil, shade; intolerant of fire, salt (USDA, NRCS 2006). Notes: Seeds eaten by some birds (Martin et al. 1951). The tubers are fleshy swellings along the rhizome. They are starchy and high in protein and were used extensively for food by Native Americans and European colonists. The seeds are edible cooked. (Yatskievych 2006). 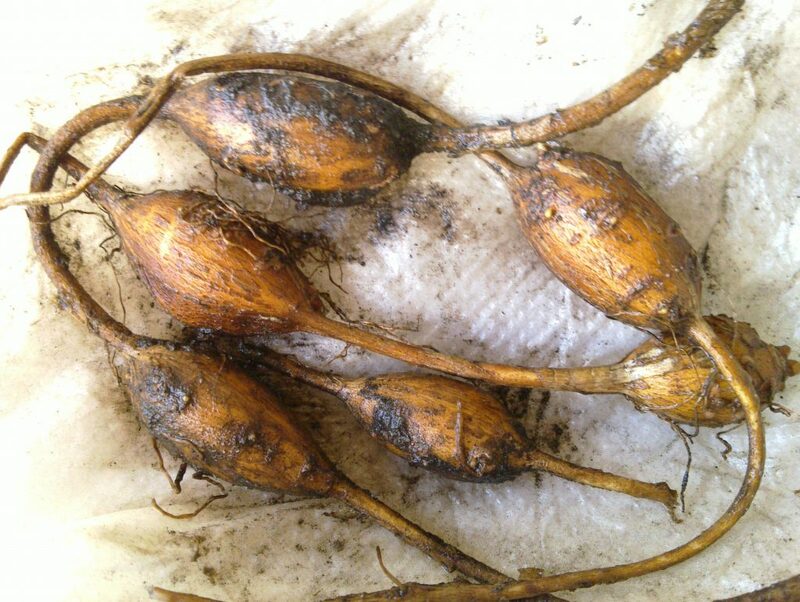 A chemical analysis of the dry tuber reports the following: crude protein 17%, ash 5%, fat 3.5%, and total carbohydrate 73%. At least 60% of the total N is protein. Tannin content (10.35 mg/g); it has been studied as a potential crop plant at various times but apparently is difficult to harvest on a commercial scale. Apios americana is attacked by various fungi including: Microsphaera diffusa, Phymatotrichum omnivorum, and Puccinia andropogonis var. onobrychidis (rust); Alternaria sp. (leaf spot), Cercospora tuberosa (leaf spot), and Erysiphe polygoni (powdery mildew), (Duke 1983). The young shoots are eaten by slugs (Fern 2004).